When we first moved to the States my parents were always working, sometimes day and night. We never really sat down together to enjoy dinner, we just ate whenever we had some free time. Now when I come home to visit I always make an effort with dinner, food always bring the family together. I actually look forward to sitting together with my family to enjoy a traditional family style meal where we share rice, some sort of protein, and a soup. It feel like time slows down; my dad reminiscing about his past and our family nearly choking on our food due to his out of this world stories. You just can't do the same thing with a bowl pho. Vietnamese family style meal is meant for family to chit chat between bites. We must cherish these times that we easily take for granted. One of many favorite family style dish is Suon Ram Man, it taste like a dry and saltier version of thit kho (pork belly braised in caramel sauce). 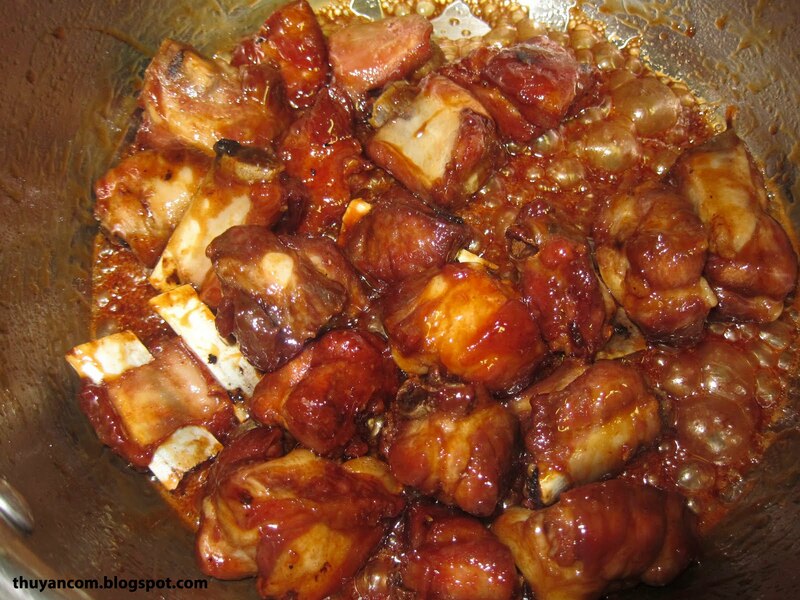 You braise the spareribs in caramel sauce until it is completely reduce. 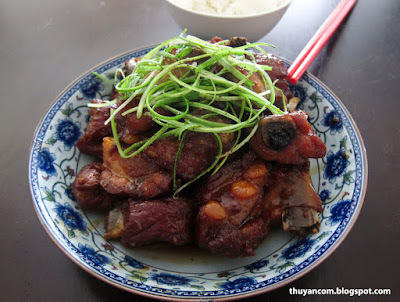 In the end you are left with crispy spare ribs from the caramel sauce sticking to the outside of the meat. I used to not like a lot of pork products when I was little (don't worry I got over that stage), but every time my mom made suon ram I would pick at every little pieces to the bone. Every part of the meat was glazed with the caramel sauce, the outside was crispy but the inside was so juicy. I love biting into all the fat and of course my favorite part is the cartilage. When it's cooked long enough I will gnaw on the bone, don't judge me bones are awesome! To reduce some of the cooking time and achieve a wonderful crust on the outside, I cheated and used my deep fryer. You can totally skip this step and do it the old fashion way. Family style dish is meant for sharing, so please share this recipe with your love ones. 2. Marinade with a couple dash of garlic powder and 1 tablespoon of fish sauce in the fridge for a couple hours. 3. Throw it in the deep fryer until the outside become crispy. Remove and let meat cooled in a lot of paper towel. This will help remove some of the oil. 4. In a pot (I like using nonstick pot or pan), melt tablespoon of sugar. As soon soon as you see some color, add 1 tablespoon of fish sauce. This part will probably be the most difficult part. If you let the sugar cook too much it will burn by the time you add the fish sauce. 5. Add the deep fried spare ribs, garlic, and shallots. Coat all the spare ribs in the caramel sauce. 6. Add 1/2 a can of coconut soda. Let the meat braised in the sauce for 10-15 minutes on medium heat. 7. Turn the heat up a little and let it it cook until the sauce begin to charring the outside of the meat. Be careful not to let it burn. Sprinkle some black pepper on top. 8. Serve and enjoy with a bowl of white rice. You just can't do identical issue using a bowl pho. Vietnamese loved ones design food is meant for loved ones to chit chat in between bites. 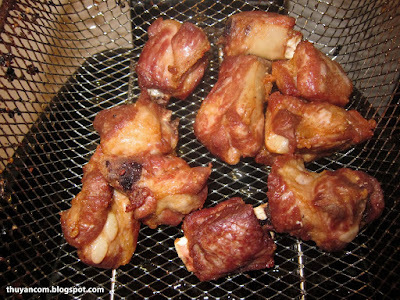 hi, what If I don't want to deep fry the ribs? I'm so sorry for the delayed response. If you do not want to deep fry the ribs before hand then you can just braised it in the caramel sauce on low heat. When you have cooked the ribs through you can turn the heat higher to reduce the sauce.